U.S. silver half dollar coins are fractional U.S. silver coinage with a silver content of 90% of its mass, gross weight of 12.50 grams and face value of 50 cents (one half of a Dollar). The silver half dollar metal composition is 90% silver and 10% copper. This type of coin is 1964 and older. The main types are the Franklin Silver Half Dollar and the Kennedy Half Dollar. There are few other much less common silver half dollar types. Very few truly qualify as high value collectable coins. All silver half dollar coins are numismatic bullion. As most U.S. Silver fractional coinage, most silver half dollar coins are noticeably circulated. This is specially true of the Franklin Silver Half Dollars, which are the most common silver half dollar coins by far. Most of this coins have lost part of their mass, and / or are somewhat deformed because of constant beating. Few Franklin silver half dollars retain their original mint weight. 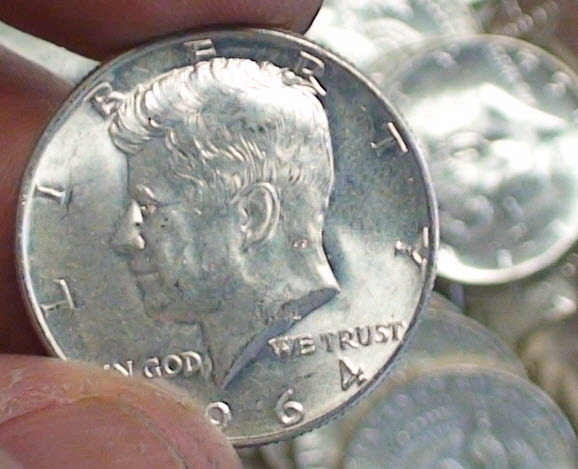 However, since Kennedy silver half dollars were only minted in 1964, and a lot of these silver coins where basically stored, they are usually intact. The original gross weight of all U.S. silver half dollar coins is 12.50 grams. Of this, 11.25 grams are silver (90%) and 1.25 grams (10%) are copper. Franklin half dollar coins have been around a long time, so a lot of them are pretty eroded. As long as these silver coins are still recognizable, they still qualify as silver coins. However, silver coins that are so eroded that are basically flat, only qualify as scrap silver. As with most U.S. silver coinage, since the U.S. Treasury stopped minting them silver coins 1964, silver half dollars were steadily removed from circulation by both banks and individuals. Because silver half dollars are so evidently different, this happened a lot sooner than with silver quarters and dimes. This happened because Silver Half are worth several times their face value. Even the 40% silver half dollars are worth a lot more than their face value. Now a days most silver half dollars are kept as precious metals investment, or for collecting and trading at coin fairs. Walking Liberty silver half dollar coins were minted from 1916 to 1947. This is a very plentiful type of silver coin. This is the silver half dollar coin with the longest production time. Walking liberty silver half dollars are 90% silver and 10% copper. They are distinguished by the walking lady liberty image. Other than the few proofs and graded ones, Franklin silver half dollars are numismatic bullion. Franklin Silver Half Dollar coins were minted from 1948 to 1963. These are maybe the most available silver half dollars because so many were minted. Franklin silver half dollars are 90% silver and 10% copper. Other than the few proofs and graded ones, Franklin silver half dollars are numismatic bullion. Silver Kennedy half dollar coins were only minted in 1964. Of this, less than 2% were proofs. Kennedy silver half dollars are 90% silver and 10% copper. There a lot of this silver coins left, most of which are used for investment and collection purposes. Other than the proofs, silver dollars are numismatic bullion. 40% Silver Kennedy half dollar coins were minted from 1965 to 1970. Reason they have the same appearance as the 90% silver Kennedy half dollars is their construction. Rather than being a uniform material, they are silver clad. The core is copper, the cladding is 90% silver. The very vast majority of silver half dollar coins are worth only their intrinsic precious metal value. Few Kennedy, Walking Liberty and Franklin silver half dollars are collectable coins. Of these, even fewer command super high value. Because of this fact, and due to there being millions of these silver coins, the chances of finding a collectable silver half dollar coins in circulation is low. Silver half dollar minting goes way back into the beginning of the U.S. Republic. Truly historic silver have dollars can be quite valuable. Not considering the historic – numismatic silver dollars, there are two ways of selling silver dollars. Silver half dollars can be sold either by by face value multiplier or weight. Either method is good and achieve very close results. In the weight method, the coins are weighted, and paid for by the gram. In the face value method, the total face value of the silver coins is multiplied by a constant that includes a factor for the average weight loss of the coins. Call Portland Gold Buyers, LLC at 971-222-3435 to sell silver half dollars. This is one of the most reputable precious metal dealers in Portland. Portland Gold Buyers is always buying silver coins. In addition, there are plenty of other coin and precious metal dealers in Portland. 1818 Silver Half Dollar. Note that this silver coin is so eroded has neglegible collector value. The value of this silver coin is just above melt value.